Too much excitement just might kill me! My goal for Monkey’s birthday is now to finish 8 pages plus a cover. This one is a double page spread, so I’m halfway there! 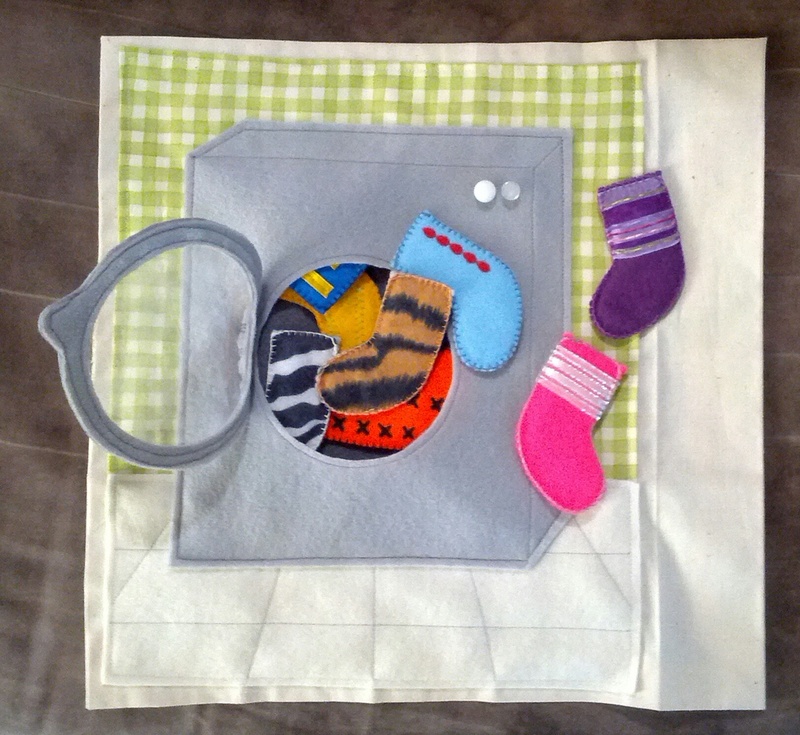 Match each of the socks from the dryer with its pair – magnetically! I take no credit whatsoever for this idea – it’s a straight steal from Imagine Our Life, who continues to be my primary source of inspiration for all things quiet book! Part of the problem I’ve been having is using calico and cotton fabrics for the backgrounds – they fray, and so I’ve been pressing the edges over before sewing. The first couple took me ages, measuring and cutting the pages, measuring and ironing the hems. Then it occurred to me to make a template! Genius. I cut the page and background shapes from thin cardboard, and I just chop the fabric roughly to size, fold it over the template and press. So much quicker! I machine stitched the floor tiles and the dryer, and used clear plastic tablecloth for the dryer door. 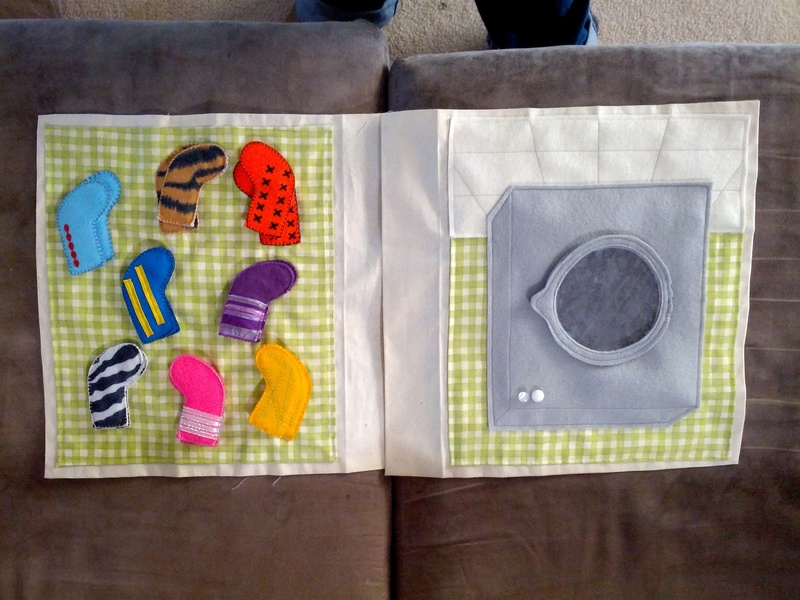 Inside the dryer I used a darker felt, and then added buttons for the knobs. 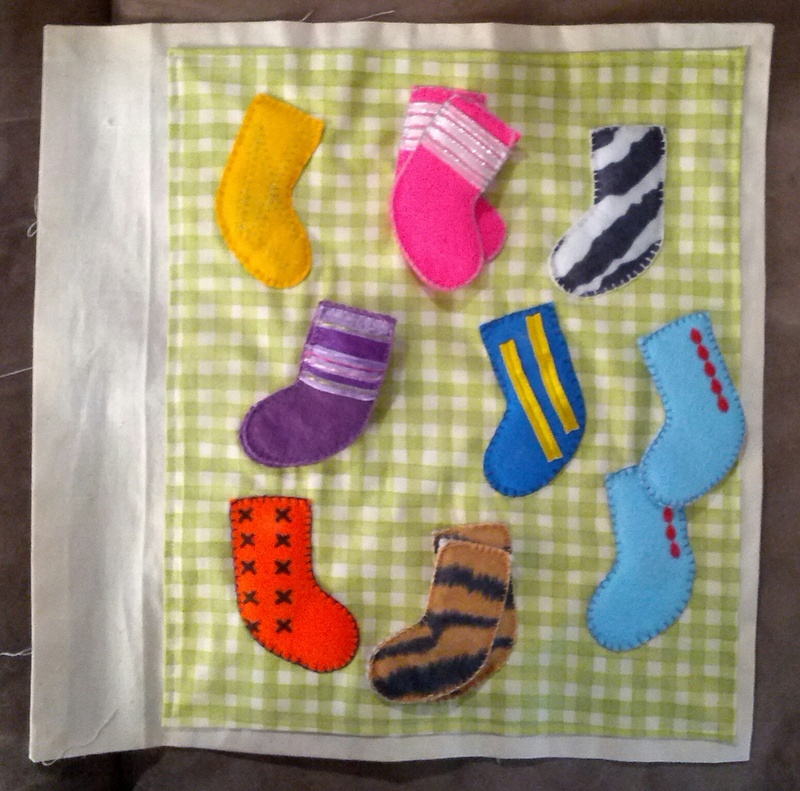 The socks are a combination of fancy felt and plain felt decorated with ribbons or machine stitching. 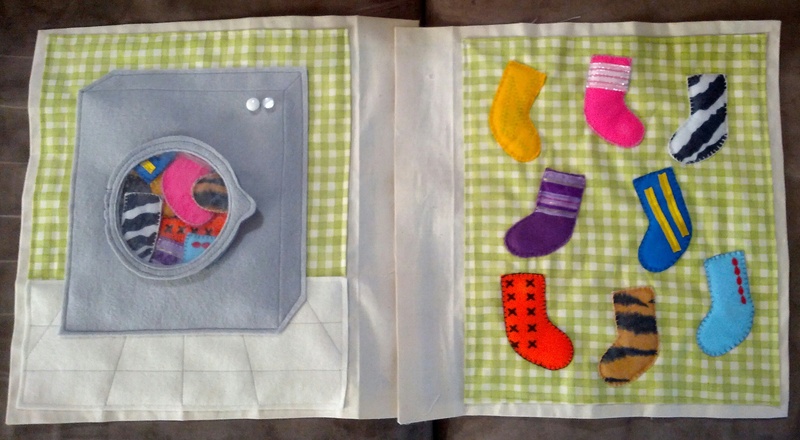 The only magnets I could find strong enough to stick through two layers of felt were fat round ones, so I cut a hole for the magnet inside a layer of wadding and sewed them inside the socks on the page. I superglued them in place because I couldn’t find my hot glue gun (its’ still in a box somewhere!). Then I scoured the house for something to use inside the free-floating socks. 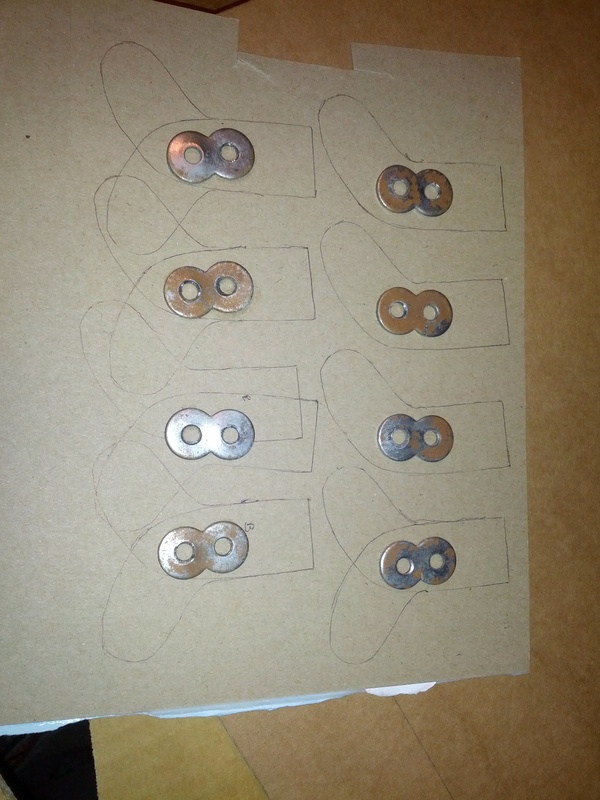 Eventually I discovered these funny figure 8 washers that the cabinetmaker had used to fix our kitchen bench together while it dried. For some reason we’d kept them, and had the same number as I had magnets. Perfect! I superglued them onto cardboard and then stitched those inside the socks. I had to hand stitch all the socks because it was too hard to do on the machine, but I like the combination of machine and hand work. Ohhhh it’s coming along so beautifully! This is one of my favorite pages. HOT DAMN, lady, that is so amazing. AMAZING. You got skills. It’s really, really charming. I want a pair of socks like the ones with the little red dots! Monkey must be pretty awesome to warrant this level of loving labor. This entry was posted on June 18, 2013 by boringyear in quiet book, the craft.